This podcast was sponsored by KidooLand the Little English School who have just opened inscriptions for the Summer holidays for 4-16 year olds and September for 0-16 year olds. 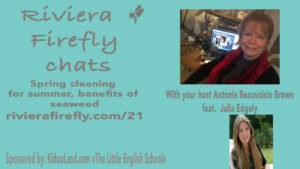 A pdf on all the books mentioned in the last 10 podcasts will be available for download www.rivierafirefly.com/bookclub. Getting ready for Summer: Organising the home and your well being This is the 3rd in our mini series for Getting Ready for summer..
..the weather here in the Cote d’Azur has suddenly changed overnight and we are coming out of our winter hibernation ..So what do I do at this time..
Tip- Mr Propre Magic eraser is just fantastic at getting rid of wall marks..
Julia Edgely seaweed Dulce . KidooLand will have different themed weeks through July and August for maternelle and primary kids based out of our Vallauris Sophia centre. Our premises is a year round one and so everything is set up for the little people . Now we are fully airconditioned which makes a real difference when the temperatures get up. Guidelines recommend we stay out of the sun from 11-16 and so it makes more sense to stay put with the little ones and even do half days if you can so they can have a lie in play in the garden at home before coming to us. Older kids we take out to the park and the Nautipolis swimming pool . It’s really with the Ados that we get to explore the Cote d’Azur in great depth .. Mougins, Cannes, Biot and more for cultural and really fun outings and this year we add in community awareness projects ?I’ve also been able to recruit some older teens to come and get some work experience with us and be there to interact and keep the English conversation flowing. Copyright (c) 2018 Riviera Firefly.